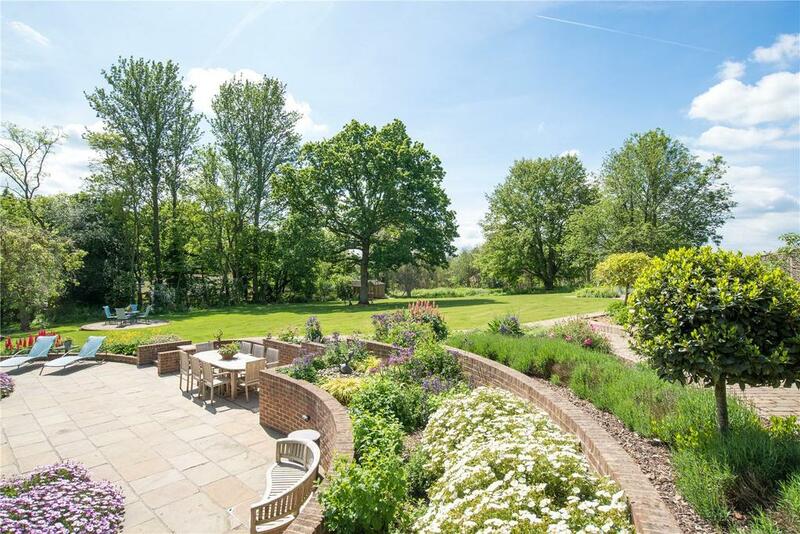 Bilting Court in the dreamy Stour valley, six miles north-east of Ashford, last came to the market back in 2009. 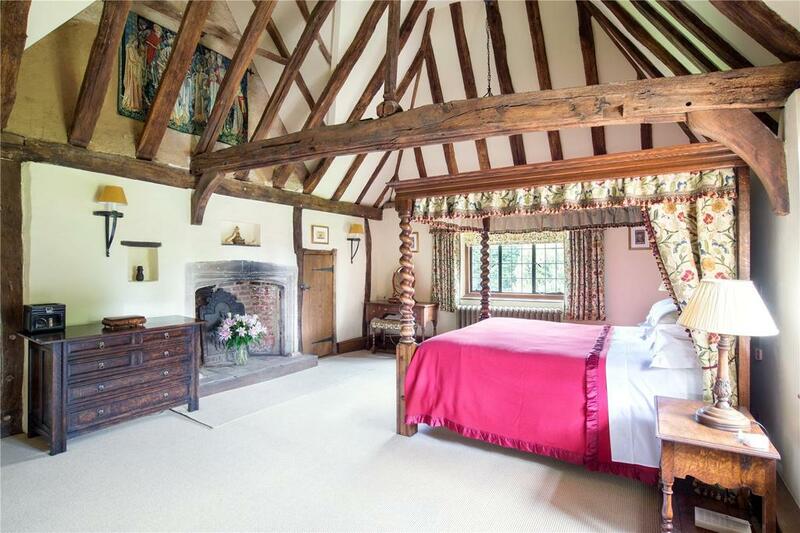 It was described by selling agents Strutt & Parker as ‘imbued with character and charm, but now in need of updating’ – all that work is now done, and this delightful house is for sale once more at a guide price of £2m, again through Strutt & Parker. The 2009 sale came following the death, at the age of 89, of its previous owner, the prolific society painter John Ward. Famous for his portraits of the great, the good and the royals (he gave sketching lessons to The Prince of Wales), which earned him a CBE in 1984, he and his wife moved from London to Bilting Court in 1954. Ward’s wife predeceased him by several years and so the house, covered in hand-painted pastoral murals across its walls and ceilings, was in need of a serious overhaul when its present owners bought it. 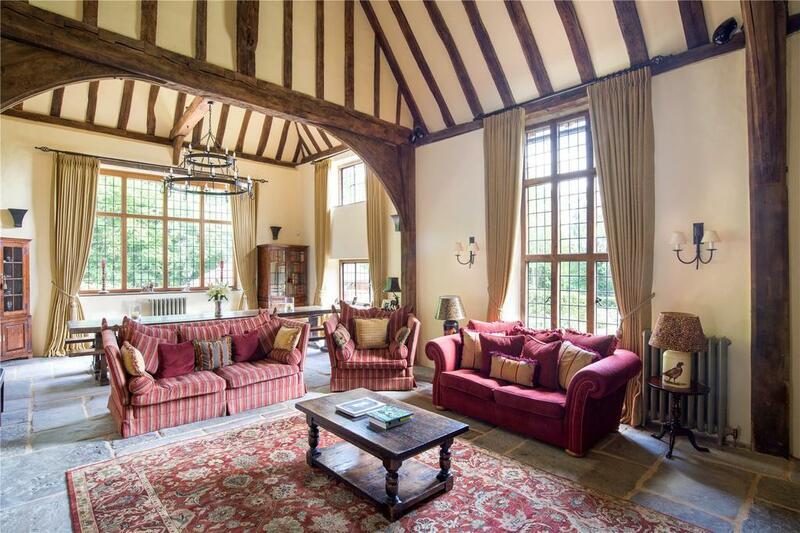 Originally a 15th-century hall house, Bilting Court has seen many alterations over the years, including a major remodelling in the fashionable Lutyens-esque style in the early 20th century and, most recently, the addition of a garden room and a newly constructed range of outbuildings. Now, beautifully renovated, it’s back on the market, still imbued with character and charm, at a guide price of £2m, again through Strutt & Parker. Centred around its magnificent medieval hall, the house has 4,952sq ft of comfortable living space, including splendid entrance and reception halls, two main reception rooms and a fabulous kitchen/dining room overlooking the gardens, the adjoining farmland and the Wye Downs – views shared by the newly built oak-framed garden room next door. 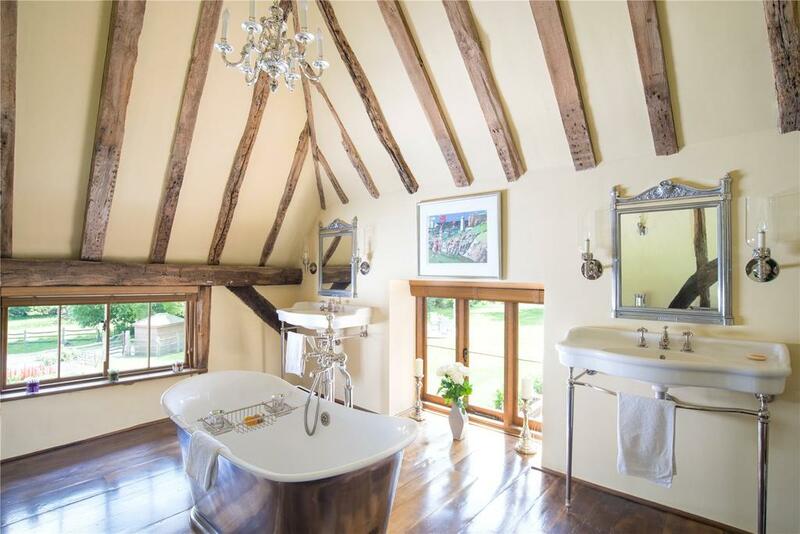 A fine oak staircase leads to four first-floor bedrooms, the most impressive of which is the master, with its original timber framing and crown post and stylish contemporary bathroom—a nice touch of luxury that blends happily with the rustic charm of the ancient timbers. The same love and attention to detail have been lavished on the garden, which has been landscaped to fit the surroundings of the house, with a meandering brick path running past lavishly stocked herbaceous borders to a circular bed with a restful seating area. From here, lush lawns lead to a lightly wooded area at the end of the garden. In all, Bilton Court has almost 6½ acres of gardens and grounds, including a kitchen garden, a pond and a paddock. Bilting Court is on the market with Strutt & Parker at £2 million – see more pictures and details.